Presenting a baby rattle Christmas tree ornament with authentic aurora borealis Swarovski crystals and 3 pink or blue stones inside the rattle. Ornament is shown in peony pink with three pink stones inside the rattle for a girl. 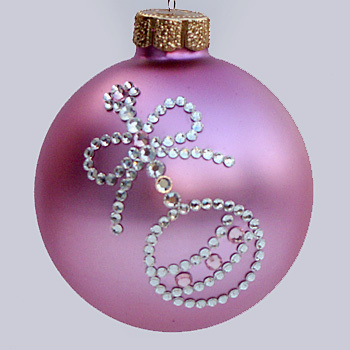 Ornament is also available in baby blue with blue stones for a boy or white pearl with either pink or blue stones. When ordering, please specify BOY or GIRL. Baby's first Christmas rattle Christmas tree ornaments with authentic aurora borealis Swarovski crystals can be purchased at Designer Ornaments. Baby's first Christmas rattle Christmas tree ornaments depicting a baby rattle for boys or girls can be purchased at Designer Ornaments.